The 10-part fourth season of the sci-fi series is in the works for Blu-ray. 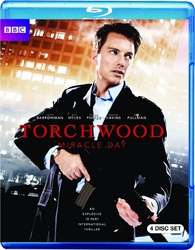 In an early announcement to retailers, Warner/BBC's 'Torchwood: Miracle Day' appears to be coming to Blu-ray in the near future. When convicted child killer Oswald Danes (Pullman) miraculously survives his own execution, the footage holds America transfixed. And then everyone realizes that nobody is dying. All across the world, nobody dies. And then the next day, and the next, and the next. People keep aging -- they get hurt and sick -- but they never die. The result: a population boom, overnight. With all the extra people, resources are finite. It’s said that in four month's time, the human race will cease to be viable. But this can’t be a natural event – someone’s got to be behind it. It’s a race against time as CIA agent Rex Matheson (Phifer) investigates a secret British institution named Torchwood that seems to hold the answers, and finds only two surviving members: Gwen Cooper (Myles), who has retreated to a remote Welsh hideaway with her new family, and the mysterious, brilliant Captain Jack Harkness (Barrowman). But soon they all find themselves in the same fight against the greatest threat humanity has ever known – humanity itself. Specs, supplements, and a release date have not been set yet, but suggested list price for the Blu-ray is set at $59.99. You can find the latest specs for 'Torchwood: Miracle Day' linked from our Blu-ray Release Schedule, where it's indexed under PENDING.